Pure IP-PBX Phone system for medium to large businesses. 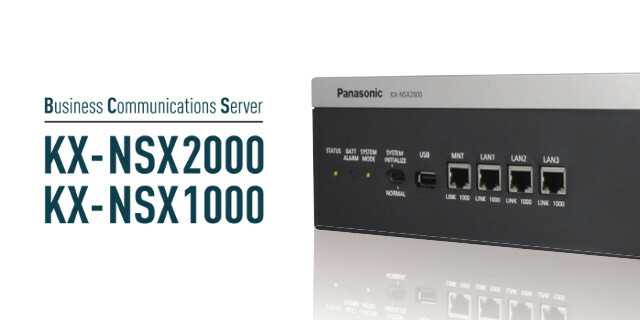 The Panasonic KX-NS1000 Business Communications system is a highly scalable IP based phone system that has been designed to address the requirements of any company – from small-medium businesses to enterprise customers. The KX-NS1000 can support up to 1000 extensions with one-look network. The KX-NS1000 includes an advanced call routing function for small to medium size call centres without need for an external server. Adaptable to the way each organisation works, the KX-NS1000 not only operates as a pure IP system, but also allows existing Panasonic legacy systems to expand, via integrating with the Panasonic KX-NS1000. Legacy systems that are supported and that can be upgraded to KX-NS1000 include: KX-NCP500, KX-NCP1000, KX-TDA100, KX-TDA200 and KX-TDE200 systems. No matter how large or small, the KX-NS1000 is suitable for all kinds of businesses or industries. 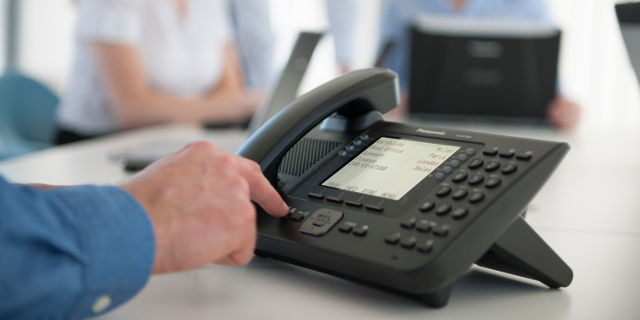 Phone systems for medium to large businesses. 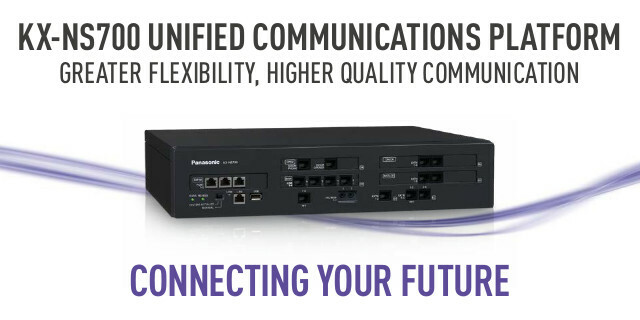 The Panasonic Business Communication server KX-NSX series delivers the next generation of IP unified communications to meet today’s working environments. The KX-NSX series is an ideal solution for any mid-sized company with multiple offices or for large single site offices, as it is highly scalable and supports up to 2,000 users and simultaneously connects up to 32 sites. The KX-NSX series enables companies to spread out over multiple locations without the need to have an administrator at every site as management of the entire network can be performed remotely which enables low cost operations. The KX-NSX series provides 1+1 redundancy when both a primary unit and secondary unit are installed. In the event of a failure, operation will seamlessly switch to the secondary system ensuring maximum uptime for business communications. In a multi-site network, the KX-NSX series can also protect against network failures through the deployment at the local branches of KX-NS700 or KX-NS1000 systems as expansion gateways. In the event of a network failure, the KX-NS systems at each site can operate as a stand-alone system in a simplified isolated mode to reduce and minimise business interruption. Introducing a phone with a built in video camera. 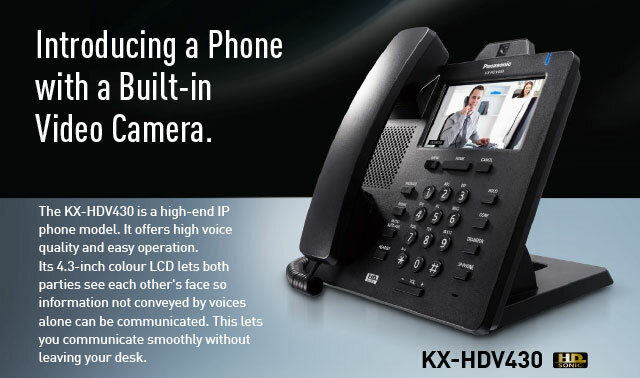 The KX-HDV430 is a high-end IP phone model. It offers high voice quality and easy operation. Its 4.3-inch colour LCD lets both parties see each other’s face so information not conveyed by voices alone can be communicated. This lets you communicate smoothly without leaving your desk.